Many of California's gardeners enjoy relatively mild winter temperatures. Where the winter months are warm, the Golden State's native plants can produce abundant flowers even during January's short daylight hours. 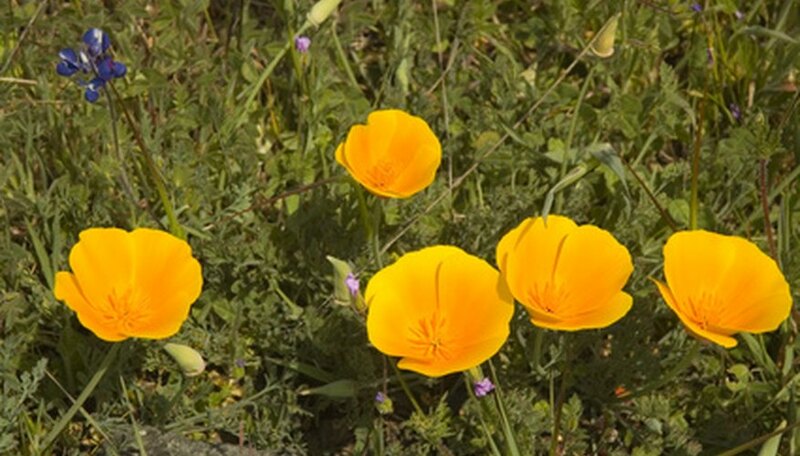 Several of these wildflower species thrive from southern to northern California or in dry soils or shady conditions where non-native plants would struggle. Ranging from ground-hugging plants to trees, they offer gardeners January color. Padre's shooting star (Dodecatheon clevelandii) is a primrose family perennial native to the western slopes of southern California's mountains. Its stems rise 12 inches above basal clumps of round, wide pale green leaves. From January to April, says the Lady Bird Johnson Wildflower Center (LBJWC), nodding clusters of showy white or magenta blooms top the stems. Flowers have four or five backward-curving petals with downward-protruding stamens. They bear a strong resemblance to cyclamen blooms. Plant padre's shooting star in partial shade and rich, moist well-drained soil. Water regularly during winter and spring. The California peony (Paeonia californica) is a perennial native to dry brush lands from San Diego to Monterey. Standing only one foot high, it has branching stems with lobed green leaves, according to the LBJWC. From January to March, the stems have single, large, deep maroon blossoms. Their petals surround dense clusters of showy yellow stamens. California peony likes partial shade and very well drained soil. Plants watered in summer are highly susceptible to root rot. Fuchsia-flowering currant (Ribes speciosum) is a shade-loving shrub native to brushy canyons of central and southern California. Standing up to four feet high, it has thorny branches with glossy deep green leaves. Between January and May, plants have abundant hanging fuchsia-like red flowers. They may drop their leaves during summer drought, but with consistent moisture remain evergreen. Plant them in well-drained soil and part shade, recommends the LBJWC. Moisture-retaining mulch may prevent leaf drop. California laurel (Umbellularia californica), sometimes called California bay, grows as a shrub or a medium-sized tree--up to 40 feet tall--depending on its habitat. Evergreen, it has narrow, glossy green leaves and greenish to reddish bark. Its crushed leaves and twigs are pleasantly aromatic, according to the LBJWC. Plants grow wild along ponds and streams and in the moist canyons of California's Coastal and Sierra Nevada mountain ranges. From December to May, they have conspicuous greenish-yellow flowers. Greenish fruits ripening to purple follow the blooms. Give California laurel a partly shady location with moist soil.